Yahoo! announced that as of March 31, 2017, the "Secure-basket" variable in the store editor will no longer be available, so publishing the site after that date will automatically make your store's shopping cart page secure (HTTPS). After April 30, 2017, if your store hasn't been switched over to a secure cart, it will be applied to every store automatically. You can read Yahoo's announcement here. If not prepared for it, this change can adversely affect your customers' shopping experience. If your store's cart has non-secure content, depending on the browser used, your visitors may get a popup warning about non-secure content or the address bar of the browser might show a broken padlock, etc, all of which might cause your visitors to lose trust and abandon checkout. Switching to a secure shopping cart is typically very easy: go to the Variables page, set the "secure-basket" variable to "Yes", and then publish the store. However, before you pull the trigger, you should test to make sure that your shopping cart is ready for this change. To do so, first go to your live store and add something to the cart. If, on the cart page, you see a secure URL in the address bar (beginning with https:) and you see no warning signs (security warnings or broken padlock image, etc.) then your store is already set. If the cart page is not yet secure (as is the case for the vast majority of stores), simply enter https:// in front of the cart URL in the browser's address bar and hit Enter. This will cause your cart to be loaded via a secure connection. If at this point you are still not seeing a broken padlock image or not getting security warnings, it means you can go back to the Variables page in the store editor, turn on "secure-basket" and publish the site. You should be all set. However, if you do see security warnings, it means your cart is not ready to be served over a secure connection. Please note, in some browsers you might need to click the little icon on the left of the URL to view security information. It should then tell you whether the page was loaded securely or not. What to do if your cart cannot be served securely? If you cart gives security warnings when you try to load it over HTTPS, the security warnings should point out what components are not secure (usually it is referred to as "mixed content".) In the simplest cases you can log into your Store Manager, go to Checkout Manager, and locate the indicated content under either "Checkout Wrapper" or under Page Configuration", and attempt to simply change the reference to https. In more complicated cases it is possible that non-secure content is loaded through CSS or JS files which might be more challenging to fix, or in some cases not even possible. Of course if these changes seem complicated or too challenging, we are here to help. When you order our "Securing your Shopping Cart" service we make the transition for you without you having to worry about breaking or adversely affecting your shopping cart. 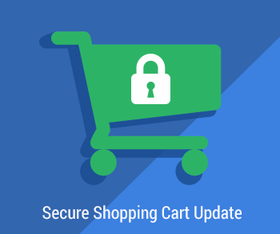 If your store has a floating shopping cart from Y-Times, we will upgrade that implementation so that it is ready for a secure cart. If your store has a third party floating cart not from Y-Times, we can identify this for you. In case it doesn't work with a secure cart, you will need to contact the vendor who implemented it on your site for assistance.